Emirates Skywards, the airline’s award-winning frequent flyer programme has unveiled new designs for its membership cards in 2016. Each of the four cards features winning designs from aspiring artists around the world, and depict the top four ‘Dream Destinations’ voted by Skywards members. Into its 5th year, the Art of Travel programme has continually engaged young artists worldwide in an annual competition to feature their artwork on the four Emirates Skywards membership cards. This year, the airline engaged with its members to vote on their four ‘Dream Destinations’. Over 250,000 Skywards members participated and the top four destinations were revealed to be Dubai, Paris, London and New York. The frequent flyer programme then invited artists from art institutions around the world to submit their creative interpretation of any of the four destinations. The submissions came in various formats including graphic design, photography, 3D paper sculptures and paintings. After several rounds of shortlisted entries, over 80,000 Skywards members voted the winners: Marconi Calindas, 40 years old, from the USA; Nick Jackson, 35 years old, from the United Kingdom; Mukta Changmai 26 years old, from India; and Kateryna Bortsova, 30 years old, from Ukraine. 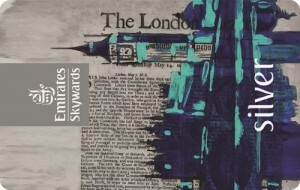 Their work will be reproduced on the 2016 Emirates Skywards membership cards. The four cards represent the different tiers – Blue, Silver, Gold and Platinum – with each tier providing exclusive privileges. “We continually engage our diverse base of members and bring them closer to their passions be it sport or art. The Art of Travel programme gives an avenue to aspiring artists from all over the world to have their work featured on a global stage. We received a large number of high-quality entries from talented artists and are very pleased with the outcome,” said Dr. Nejib Ben Khedher, Senior Vice President, Emirates Skywards. Emirates’ award-winning frequent flyer programme now has more than 14 million members worldwide. In addition to mile redemption, members enjoy various partner offers as well as access to some of the biggest events worldwide including top-tier football matches across Europe, Formula 1 races and the most recent Rugby World Cup 2015 held in England.